Welcome to the specialists in swimming pool cleaning and pool maintenance services across Sydney’s Eastern Suburbs. Our reliable team of swimming pool technicians will take care of all your pool needs. Whether you have an above ground pool, an inground pool; salt water or chlorine; our professionals will tailor their service to suit your pools conditions. We check, test and adjust your swimming pool’s water chemical balance and ensure that your pool equipment is running smoothly. Our regular pool maintenance services will have your pool clean and ready for use any time of the year. If your pool needs a new chlorinator, it’s time to replace your pool pump or you’d like solar pool heating installed; our friendly experts know how to look after your more advanced pool care needs. We offer a range of pool supplies at reasonable and competitive prices, give us a call today to discuss your swimming pool care. Nothing beats the luxury and convenience of owning your own swimming pool. But it takes regular maintenance to keep the water crystal clear with your pool clean and safe to swim in. Living in the Eastern Suburbs of Sydney, we understand not everyone has the time to keep up their pool care needs. We offer a range of pool maintenance services where our experienced technicians will come to you. 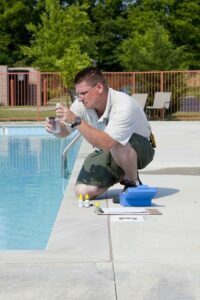 Your onsite pool technician will begin with a water health check and advise you of the right chemicals for your pool. This is essential to keep the levels of bacteria and algae low. A maintenance and pool cleaning service will then be tailored specifically to your pool. Such a large mass of water needs constant attention to keep it healthy all year round. But there’s no need to worry, we take care of everything with our pool cleaning services tailored for your swimming pool. Our experienced pool cleaners will arrange a time and date that is convenient for you. All the essential pool cleaning supplies and services will be taken care of; water treatment/chemical balancing, pool vacuuming and equipment checks. If there’s anything out of the ordinary, we will always consult you before taking any further action. To keep your pool sparkling clean and ready for use any time of the year you may choose from a weekly, fortnightly or monthly pool cleaning service. 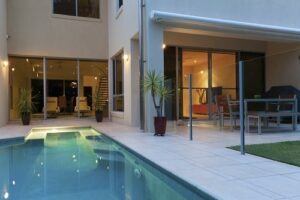 We also offer customised services such as increased pool maintenance while you’re away on holiday. Whether you’re in need of a pool cover, an automatic robot vacuum, a new chlorinator or you’re just not too sure what it’s called, we can help. Our experienced team will supply and install all your pool equipment and accessories. When you add our pool cleaning service as part of your regular pool maintenance program, you can relax in the comfort that your swimming pool is being professionally managed and will be clean, safe and sparkling all year round. Give us a call today to find out more about our Eastern Suburbs pool cleaning services. Above ground pool or inground pool? With swimming pools, it basically comes down to your personal preference. However, the differences don’t just stop with above ground or inground. Each swimming pool is uniquely different either from the material it was constructed with such as fiberglass or concrete; to the body of water it holds such as chlorine or salt water. For our team, no matter what your pool type, it will always come down to regular pool maintenance and cleaning. If you’re a new pool owner with an above ground or an inground pool; fiberglass or concrete; chlorine or salt water pool; we can teach you the fundamentals of pool maintenance and pool cleaning for the type of pool you have. Knowing the basics is essential for your pools health care. Without constant maintenance and checks on the chemical levels in your pool, you run the risk of causing damage. The first sign of neglect is when the water loses its sparkling clear appearance turning to a cloudy green colour. If ignored, this can easily turn your pools water to a dark green and even black. If you have a green or black swimming pool, give us a call to discuss our green pool treatment. We can safely bring your pool back to life and teach you how to stop this from happening again. Finally, we also provide a pool building service if you are looking to build a brand new pool.